What is Power Supply "Sag"? "Sag" is a well-known power supply effect caused by resistance in the supply and variable current loading. As an amplifier pulls more current from the supply, the supply voltage drops, or sags, and this can cause a compression effect. The transient or attack portion of a note is "squashed" or limited by the falling supply voltage, and thus the attack part of the signal envelope blends with the sustained portion. Sonically, we perceive this as a "rounding" or "smoothing" of the tone as the attack portion of the signal envelope has been cut down to be the same level as the sustain portion of the envelope. Since the attack is no longer abrupt, you might feel that the "edge" has been removed. In compression terms, this is "limiting" or "soft compression". If you push the amp further so that the whole signal is clipped as the amp runs out of headroom, the supply stays sagged and the signal is "hard limited". This sounds brighter than the soft limiting but is a different tone than the original unlimited sound from the non-sagged amp and supply. Note that the sustain effect is subtle. If you have Power Scaling installed in the amp, then the Power Scale controls will let you dial the amp down to its compression point quite easily. 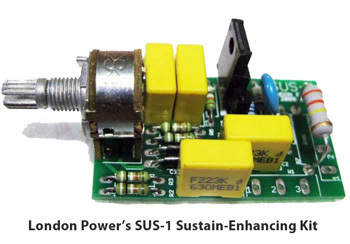 In a non-Power Scaled amp, or for a preamp, the sustain effect can be attained using London Power's SUS-kits, which provide an identical sound using a compression side-chain circuit that samples voltage instead of current. These sustain-enhancing kits use non-critical 16mm pots and other components to achieve the desired compression effect. An amplifier with any power rating can be fitted with one of the SUS kits. SUS-1 can be used with any non-Power Scaled fixed-biased amplifier. Our RBX Raw Bias Auxiliary Supply Kit may be required for proper functioning. SUS-2 can be used with any cathode-biased amplifier, regardless of whether the amp is Power Scaled, and can also be used in preamp circuits. SUS-3 is for fixed-biased amplifiers fitted with Power Scaling, or a fixed-power amp that has our TBS Tracking Bias Supply Kit for Fixed Bias installed. If fitted with our SV1, use SUS-3 to add sustain. If fitted with our SV2 or SF-2, use SUS-2 to add sustain. If switchable between fixed-bias and cathode bias, use SV1, plus SUS-3 for sustain. Use SUS-3 and RBX For non-Power Scaled amplifiers without TBS: Use SUS-1 and RBX. Note: Proper functioning of the SUS kit with the fixed-bias Power Scale kits or TBS may require the addition of the RBX to assure function of SUS all the way to full output power. RBX provides a much higher raw bias voltage than most stock bias supplies, and at a much lower impedance. Both attributes are important for proper functioning of the SV1 and TBS, but becomes more important with the addition of sustain.